The Pacific Institute provides thoughtful new analysis to help move beyond the theoretical quagmire that has characterized the debate over water use efficiency for decades. 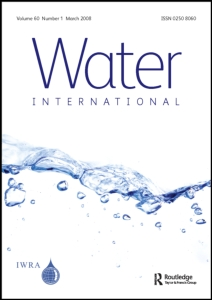 A newly published peer-reviewed article in the journal Water International analyzes three fundamental flaws in the traditional approach to water-efficiency or the “basin approach,” including the assumption that all consumptive water use is beneficial, a lack of attention to water productivity measures, and the numerous, important “co-benefits” that are either ignored or discounted in most basin assessments. The new article, Water-Use Efficiency and Productivity: Rethinking the Basin Approach describes how water use goals have changed over the last decade, and therefore why our metrics and approach to understanding the potential for increased efficiency and productivity should also change. In the twentieth century, the primary objective of water policies was to simply make more “new” water available for human use through the construction of infrastructure to store, move, and distribute water. But total water use is now understood to be a poor indicator of the value or productivity of water, and a poor indicator of true efficiency. The “soft path” for water recognizes that the real purpose of water use is measured in the goods and services provided by that use. “The debate about water use in California agriculture is stuck in a 30-year-old rut; relying on outdated and technically-flawed thinking that is slowing statewide efforts to meet 21st century challenges. This is exemplified by the recent release of a study authored by researchers at the Center for Irrigation Technology (CIT) and funded by a Sacramento-based farm lobby group (the California Farm Water Coalition) and the U.S. Bureau of Reclamation. The CIT study uses old theories of water-use efficiency to argue that the potential to improve efficiency of water use in California agriculture is tiny. If the authors of the study are right, the only options for saving water in California agriculture would be to dramatically change crops or to take a considerable amount of agricultural land out of production – which would be bad news for our farming communities, our economy, and our environment. The good news is that they are wrong…” Continue to the full blog post. Water-Use Efficiency and Productivity: Rethinking the Basin Approach examines how the traditional approach to water management obscures many important opportunities for increased benefits such as increased productivity or important co-benefits that are often completely ignored. The article argues that the failure to consider the many additional benefits of improving water-use efficiency – including improved crop productivity, improved water quality, greater water supply reliability, decreased energy demands and associated greenhouse gases, and reduced or delayed infrastructure investments – limits the range of solutions for complex real-world problems.The old “basin approach,” developed in the late 1980s and 1990s, calls attention to evaluating water use in basins as a whole, arguing that in water-stressed places like California, most water is ultimately used beneficially or productively, even if there are small-scale or field inefficiencies. It assumes that most losses are simply re-captured and re-used somewhere else downstream and therefore, there is no real potential for improving water efficiency. This way of thinking does not adequately address key issues of concern today, including droughts, water-quality degradation, the ability to improve water productivity, and an array of environmental problems. 3) failing to account for the many highly significant “co-benefits” of efficiency actions.